Transifex puts you in control of the localization process. Automate, manage, translate and collaborate on everything from apps to documentation to subtitles. Transifex accepts a wide variety of supported documents for uploading. Additionally, their support typically responds within 24 hours, which I really appreciate. They go above and beyond to resolve your issue in as few back and forth conversations as possible. Learning curve for my translators to figure out how to use and navigate must be medium to high, as I often have to do my best to direct them to the project that contains their file to translate. On the plus side, once they complete one translation, they are set for life. Transifex must have been updated recently, as I have noticed the page loading speed has decreased. This is most significant when I am deleting a resource, which can be quite frustrating. The loading indicator at the top of the screen is very thin and I hadn't noticed it for a few days. The indicator transition is also weird because it goes slow and steady initially and then stops at 50% for a good while and then the task is completed. My company uses Transifex for all translations of our products and software. "A product that has has people behind that know and listen to my needs." The simplicity of UI, it is easy to use and provides many features that come in handy once you start to have many strings to handle. The filtering and features that help improve our workflow. Transifex has increased our development velocity. Providing one place where content owners can easily manage their content together with the translators. We keep releasing at a fast pace and I see no issues in expanding due to its flexibility in upgrading the accounts. Keeping all our content in one has made Transifex worth it. No more having to deal with multiple external files. What Translation Management solution do you use? - The platform is very easy to use and is pretty intuitive for users of all types: localization managers and translators alike. - The customer service is fantastic! Thelma and Nina are super nice and very attentive, their answers to our questions our thorough, they provide step by step instructions on how to carry out tasks that we find difficult and are always patient with us. The reply fast, investigate the issues we report (when there are bugs) and update us on the progress of fixes. - The Transifex team as a whole is wonderful to work with. They really listen and over the years incorporated a lot of what we requested into their platform. For example: tags (like notranslate and locked), customizable parameters, ability to upload screenshots and tag the strings that correspond to them etc..
- Translation checks are great! - I would prefer that the set of languages wouldn't be set in the project level but the resource level. That way you would have the project as the "subject - the theme that is common to all resources in that project" and each resource could be translated to a different set of languages. The way it is now where languages are set in the level of the project forces us to open many (that's an understatement) projects just so they could be translated to different sets of languages. We have a long list of projects - many of them for the same subject but a different set of languages. That is very confusing for the translators. - An improvement to the messages feature would be awesome! We are translating almost everything in our company through Transifex. Waze is translated to 54 languages mostly through our user community. Transifex allows us to have a platform that is easy to use internally and accessible to people from outside the company. "Perfect for marketing and project manager"
The fact that the user interface is very simple and you have a clear vision of who is doing what on any of the projects you are managing. In my case, the alternative would have been Git and since I'm a marketer this was very cumbersome for me. The ability to manage multiple languages and the facts that the tool highlight it when the user needs to keep some code untouched (we are a software company) is wonderful. The user interface is very intuitive and even if i don't use it often, it does not take me too long to get back on track if i need to use it. I also love the notification section that helps me communicated with other people working on the same project. So far I don't have dislike. We are not using it extensively but it works well for what we need. The fact that our translation process was done in a very "technical mode using Git" and that with the Transifex tool makes it possible to involve our customers in the translation process without scaring them. "The customer support is second to none"
The best thing about Transifex is actually the support that I have received from my Customer Success Manager (Thelma) and her technical support team (Nina etc). They are so fast to respond to me (usually same day reply), are very easy to set up a quick call with using Google Hangouts and I always trust that I can turn to them with an issue. Transifex is easy to implement [we are using a visual force website built on Salesforce.com], very user friendly [I picked it up straight away without really needing any training], and has the best customer support I've experienced. We are rolling out a website in >25 languages with tight time constraints, and the speed and ease at which I can make translation updates/ publish languages etc is very useful and important to the success of this project. "An amazing solution for multiple software translation projects!" We were using another platform for our Community-sourced software translations when we decided we needed something better that would allow easier contribution and better visibility on the management side (see who's doing the most translating and who isn't). Transifex was the solution. I like the Editor in general, the filters are amazing and make finding specific phrases easy. The Find and Replace feature to correct one term throughout a large project is a life-saver. Another unsung hero is phrase comments: comments on Transifex are shared throughout all languages. The old platform we used kept comments only at a language level, so I'd have 7 people asking the same question for the same phrase in 7 different languages. This way there is more collaboration even among the different language teams. I also REALLY like the support they provide. I am in constant communication with my account manager and the technical support agent, and honestly they make me feel like we're their only clients, they listen and then they solve my problems, and always with the best attitude. When there isn't a solution, they provide an alternative until they can create a solution. They also talk with my translators directly, freeing up my time by not needing me as a mediator. I honestly don't dislike anything. Of course there is always room for improvement, but it's very satisfying to see that the Transifex team is busy updating features and adding new ones. I already had one of my feature requests fulfilled a week or so ago. Things I think still need improvement: searching throughout all projects (use case: one product but three different software platforms web, iOS, Android...it would be best to be able to do one phrase search through all of them). Even more options on Reporting: I manage a large number of projects and languages, but one of my goals is to determine how much work each translator is doing, and in what projects. So I'd like one consolidated report with all the translators and have columns for words per project. And don't get me wrong, Transifex reporting is very close to being exactly what I need. It is one of the reasons we moved to Transifex. But there are still some little gaps I'd like to get filled out. I'd also prefer it if the collaborator count per plan were higher. I would recommend Transifex. It's not perfect yet, but their support team listens and they really do implement improvements thanks to feedback. It's a very powerful platform, the only issue to consider is the number of collaborators allowed per plan is lower than the competition. It wasn't an issue for us because thanks to their better reporting I could keep the collaborator number low by removing inactive translators. And they're also very flexible about this, you can talk to them and reach an agreement. But still something to consider. I have had no regrets whatsoever of moving to this platform. The main one would be keeping track of the translators' work. Extracting words translated for each translator for a given period of time used to be a very manual task for me, now it's just a few clicks away. This has made reporting much more efficient, saving time, hence saving money. The platform is also not buggy AT ALL. I never have to field complaints from translators saying the platform is down, or it's not saving their work, etc, which leads to lost work, lost time and frustrated translators (who are user volunteers! keeping them happy is very important!). This happened all the time with our old platform. So really, it just frees up time for me to do other work. Saving translated phrases and going to the next one is also much swifter than our last platform so the work is faster. The Translation Memory, which allows 100% matches to be automatically translated is another time/money saver. "Easy to use product and very responsive company"
As a novice with translation and localisation, I've had no trouble getting my feet wet with Transifex. For me, the integration with Zendesk is a critical feature. Whenever I've had questions about setting up, I either find the answer in their documentation or get a quick response if I contact Transifex. If a feature doesn't exist, they put it on their roadmap and proactively provide updates over time. The tool seems to be lesser known among translation professionals, which makes starting projects require careful planning and coordinating. I don't know whether this is more work than with other tools. Keep in mind the current and future scope of your translation and localisation needs: what type of content do you need a solution for? Transifex is a TMS system that works very well for managing web-content and software. If you also want to manage published (e.g. PDF) documents, consider how you'll integrate this into your workflow and process. Transifex serves as a TMS for our primary company website and product support webpages. We're managing tens of thousands of words, the equivalent of several small novels, which change periodically and sometimes without notice. Without a TMS like Transifex, we'd spend significantly more money for organizing and tracking our strings. "Why don't all my clients use Transifex?!" Where to start? Connecting with our global teams has never been easier. I can share new content --whether its with our dev teams in Minsk, or global translatorion teams worldwide—with the click of a button. Functions like translation Memory and suggestions make translators jobs easier. And Transifex's incredible support team (BIG shout out to Thelma Kalentzoti, Customer Success Manager & Nina Eleftheriadou, Customer Success Engineer!!) have made my job easier time, and time, and time again. There's not much I dislike about transifex. We get lots of requests from senior level managers to be added to projects (to follow them) but there isn't a designated role for that yet. Something that allows people to monitor progress (without touching anything--lol) would be excellent. I'd also appreciate if there was a way to revert to an earlier version of a project--with all it's revisions, history, translations, etc—in the event that someone (ahem , me?) accidently overrides the project with source copy from another language file. When you have multiple projects on the go at once, it's surprising how easy it is to do that. Use it. You won't look back. Transifex decreases the time it takes to effectively and efficiently translate. There's none of the back and forth of sharing excel files, waiting for the original to return before adding new content and sending out the file again. having the opportunity to add comments, send announcements, lock keys, and more is just icing on the cake. "Transifex is an effective translation management platform that facilitates global growth"
Transifex has played an important role in our global growth. We have used it to translate our marketing website using live preview, our mobile app, dashboard website, Zendesk support articles, and multiple disparate content sources. The most valuable component to Transifex is the ability to easily communicate with a network of freelance translators and our internal team around projects and specific translation strings. It has also been valuable to quickly preview live data reporting around translating projects. Our translation instance is unique in that most all of our content is written first in Chinese. This has made it difficult to effectively utilize features like glossary, and understanding the total English wordcount for projects, which is important to accurately calculate pricing when working with per word translators. We have also experienced limitations in providing visual context to translators, as the process requires uploading screenshots and attaching them to specific strings. We haven't had the internal bandwidth to utilize this process, and as a result, have struggled with translating in Transifex without much visual context. It can be difficult when reviewing translations in the app or website to pinpoint exactly where a specific string is located, but in fairness this is due in part to our Git Hub language file structure and organization. We use Transifex to translate our mobile app and dashboard website as they are consistently undergoing revisions and updates. By syncing our GitHub repository to Transifex, any changes in the language file resources are automatically updated in Transifex, which translators can quickly identify by searching for "untranslated" strings. This is helpful to know that we are always 100% updated in our translations. "Overall it works and it allows for a good translation process, but lacking in many ways"
- Price model is really strange. Who charges per word in a cloud-based world? This is almost free considering Amazon storage prices. - Lacks consistency a lot. E.g. some endpoints return JSON or HTML depending on the status (that's also really really weird). - Some features seem really useless to me. For instance why would I upload images and send positions in the image to associate with keys? I highly doubt anyone uses this (at least through the API) since it's too hard of a problem. I would prefer to have some live-editing capabilities couples with the git/resources flow. - Lacks more fine-grained communication tools, like filtering better who to send emails when a resource is created and communicating people when resources are complete or reviewed. We had to use the API and webhooks to build our own services to improve that. With all that said, it may seem they were always wrong and being stubborn. That's not the case, we also requested many stupid things and asked stupid questions along they way and they helped us understand and improve. But since the goal of this feedback is for _them_ to improve I think it's worth noting they also fail a lot on giving the best/clear support. We have set up a nice git-centric translation process for a huge project with almost 100 developers and dozens of translators in 10 languages initially (will increase a lot soon). This project involved web UIs and android and iOS apps that will be used by millions of users. Transifex enters the scene by being the tool we use to communicate with the translators and for them to perform the translations. Despite my long list of dislikes it works sorta ok and we're being able to move which is already *incredible*, but it surely could be much better. Juan, this is Dimitris, the Founder & CEO of Transifex. First off, I’d like to thank you for sharing your thoughts. Your feedback is essential for us to learn where we screwed up. I’ve been working on your feedback for a couple of days now to get to the bottom of everything you’ve shared, to research our actions (both the ones you experienced and behind the scenes discussions) and see how we can improve as a team. First off, let me start by openly sharing that we could, indeed, have been more crisp and clear with some of your questions. I know this came across as not listening, and I apologize for that. Next time we'll try to get to the point faster in our answers. If we have doubts, we'll ask to jump on a call with you to more quickly understand the topic and ask you a bunch of questions before replying. Today our pricing model is based on the features and the number of hosted words on the platform. We made multiple, lengthy research studies over the years to come up with a simpler model which would make sense. We’ve considered pricing that grows with users, languages, projects or resources. None of these variables scale correctly because of how differently our customers are using the product. While the current model is not intuitive and simple, it scales surprisingly well with the value we’re offering. Maybe this is why other some of our competitors have chosen it, too. You’ve hit the nail on the head with some of your comments. We’re putting a lot of effort into upgrading and enhancing our API, adding new authentication methods and improving things under the hood. Our decision to release the improvements fast, rather than delay for many quarters and make one massive update, made parts of the API not pretty. We plan to make progress on the full migration in the next few months. We appreciate the patience until then. And thank you for reporting the suggestion for updating phrases in bulk mode over the API — our team is currently scoping out functionality, and our internal JIRA ticket is connected to your account, so we’ll let you know our plans soon. - We’d love to hear your ideas on how you’d like the progress and evolution of your content’s status to be visualized. - We’ve made quite a few performance improvements in the last few weeks related to the UI, which should have positively affected Search in the Editor. Some of them are already live. Can you please check and tell us if it’s better now via email? - Regarding the Search field in the Editor, we couldn’t agree more that this needs work! We’ve been working on a new UI for the search. Check out your email — I’ve shared with you a mockup of our ideas, please share your thoughts with our team! Once again, thank you. Please don't hesitate to share your thoughts and feedback with our team or directly with me. "The easiest and fastest way to localize your website!" Transifex is a perfect platform for crowdsourcing translations AND ordering translations from professional translators. The Transifex UI is intuitive and all of the tools makes managing translations a breeze! If only Transifex were free... but no complaints, the ROI is there! If you plan to crowdsource translations, be sure you have a paid staff member available to help answer translator questions, fix issues, and engage your users! We can now sync translations without worrying about breaking code because Transifex has extensive error checks to ensure translations are code-correct. We can engage our community to crowdsource translations, so we are able to translate into more languages that we would be able to afford if we had to pay for translations. "Transifex works within our company"
A really great user experience ; fast and simple interface, very easy to translate big chunks of text. The texts translated previously are kept in memory, so duplicates are avoided. Also a fast implementation, publish a new part on your website and the update will be effective in seconds. Very easy to use platform, to translate with a simple, but intuitive interface. 463 languages ​​available for translation! A translation history, discussion forums, machine translation, who provide all the support needed in order to properly translate a project. You can follow the translation in real time, consult and manage your team. You can also request detailed information and a report following the translation of your project! We have no real problems with the application, it can simply be a little improved. I'll just say that a global "search and replace" feature could be nice. Otherwise transifex works as it is supposed to work. If you want to grow your business in the world, trust Transifex who will locate your website, application .. and propel you up! The website is very easy to use, the team is contactable by email or phone depending on the subscription you have. Forums are also available in case of any problems. Thanks to Transifex, we have been able to develop our application internationally and to translate the application into different languages ​​making it later more understandable. We also saved a lot of time. "Support when you need it"
We were provided support and guidance whenever we needed it. For a company that is so large, you wouldn't expect such a personal and thoughtful connection. Anytime I had a question I was never dismissed or demeaned. I always felt supported and like I wasn't alone. If I had to list a shortcoming of the platform that would be the ability to create teams and more complex permission structures. We are going to be using an external translation company, but still, have internal folks use the platform. Currently, they must all be assigned to the same team and I wish that wasn't the case. We have a product that is supported in 13 languages and needed a tool to help us visualize our localizations. I realized that through using Transifex we had many missteps in our translations process that have since been changed. Thank you for openly sharing your experience and thoughts. Localization is hard, and the role of the localization lead or translator is often a lonely role. We’re emotionally committed to the success of our customers, because we believe it brings about our own success. We will study your idea on more complex permission structures with our Product team. Great to hear we've helped remove manual steps and mistakes in your localization process! - Translation Memory and Translation Memory Groups take it to a whole new level: extremely useful feature for sharing and reusing work across multiple projects. - Would be nice to have more control over notifications, eg. ability to get a single summary email instead of multiple ones. - Having multiple Orgs under a single paid plan is a pain, requires manual limit split and allocation etc. Would be much easier if limits were shared across all Orgs. We have an active community of open source contributors. Transifex enables us to crowdsource translations in extremely efficient manner thanks to Translation Memory shared by multiple projects. "Easy to localize content in any language, smooth UI, great customer support." What I love best is the customer support! The people supporting my account are amazing. They are very supportive, helpful and give solutions to our needs. I still don't feel that we receive quality translations, from the integrated translation agencies. Also, the part of communicating with the translators while they translate a project is not easy. I would prefer if there was the ability to chat live with them, for example. Transifex is used as a database of our content and it is easy to search and find the localized content we need. It helps us greatly in managing in one place and within a few steps, all 33 languages that our company supports. The API access to so much is really great and has worked well for our team. It's quick and ensures that we don't have to slow down our work waiting on our systems to work. Functionality is great as well in terms of the pricing and efficiency of the tool. Would highly recommend. There are still a few issues to be worked out but we experience that with almost any type of software we are using like this. There has been a bit of downtime previously, but that's also fairly common / to be expected in this space. I would recommend considering simply because for the prices the functionality is there. Transifex is used for us in terms of software localization. Integrated with servers and helps with translations greatly. Overall it's been a big improvement to internal workflow and has helped streamline many tasks internally as well as given the ability to tout in business development pitches. Translators, reviewers & developers friendly UI, well-thought out structures. My experience with Transifex was great in general. That said, the collaboration part could be better. If we could use less emails throughout localization process (e.g. translators <-> reviewers) but can have conversations easier on Transifex, it would be great. Transifex does have commenting feature, but it the conversations are not so visible. 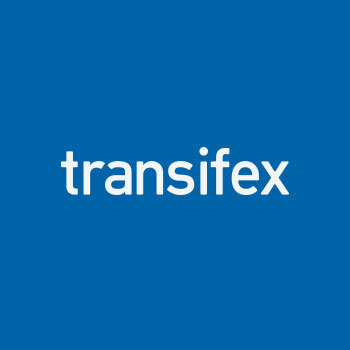 Tranisfex helps us to reach out to bigger audience and bigger market beyond English speaking countries, in a simple, easy-to-use manner. There are lots of tools out there, more impressive and more complicated but it's always more difficult to keep the tool simple and does its job. "Very supportive, very good product and great team." Support, very great team to work with. Transifex has been with us since the beginning of our localisation strategy and always advise us the best solution. Live was maybe not the best choice for us and we spend a lot of time moving from this solution to a more scalable one. We should have reviewed with them the technical solution before starting. Live is also not good for SEO. But it has been a good way to test the market with small dev effort. We grow our business outside of the UK very fast. Same for our conversion rate and traffic. Jonathan, great hearing from you! We love being there for you guys and helping you out, and we're proud to be on your side as you're scaling. We're also bummed about some of the limitations of Live, I hear you. It's great to hear you guys are taking control of that process and moving to a more scalable approach. Rock on! "It's a great software for small business for use for translation"
It's user-friendly, not expensive, and easy to learn for beginners. I love the it's cloud-based so that many people can work on it together at the same time! Also I love that it integrates with other apps and service providers so that everything flows together. Love that it translates things for us. Sometimes it can be a little bit slow to load, and also maybe add more support function? It is a really easy software to learn and use. It's definitely very user-friendly so you won't have any trouble getting used to it. Helps solve a lot of problems at work. Great for international companies and companies that do business internationally. Time management issue, pretty much just to use a tool to make doing things easier. Solving issues of team working together. But really this software helps a ton with team/company communication function. "Support agile development process and cloud based continuous deployment"
Documentation can be better; Some of the reporting can be improved. Issue: We need a localization system that can support a fast agile development process and continuous deployment every 3 weeks or less, all language translations can keep up with the English resource updates. "Excellent platform for our translation requirements." Transifex provides an ideal platform for our complex translation needs. The ability to easily split and assign projects on the fly makes our translation process much smoother. The only thing we feel is missing would be a global search, where we can identify specific strings in multiple projects at once. Transifex has allowed us to streamline our translation process and has greatly improved our ability to estimate translation costs. "Excellent for development teams and continuous translation"
The API access to pretty much anything on their platform has been great for our team. We work very quickly, so the ability to customize our interactions with the Transifex functionality has meant we don't have to slow down and we can control all aspects of our translation workflow. We leverage internal linguists for linguistic review and they've stated the core CAT tool functionality within Transifex isn't as robust as they would prefer (i.e. limited term search functionality, more robust glossary functionality, etc.). We use Transifex as our TMS of record for Product UI translation. We're a continuous release development team and need a solution to allow us to provide translations to our growing, global install base while not slowing down the pace of development. "Support has a personalized and caring approach"
We had issues when dealing with the Transifex-to-Zendesk translation vendor integration. In such scenario, Transifex did all the hand holdingto help tackle down the isuses. They helped me communicate with other vendors. They did what they could in seeking proper solutions when a current solution is absent or not available. It's obvious that there are some kinks that needs resolving. Everyone in the software world knows and are aware of this. We're publishing our user support content in the form of articles for Zendesk Knowledge Center. We then have those articles translated into other languages. The translation process involves Transidex as the medium between us and our translation vendor. We're using it in automating translation orders, extraction purposes, and uploading content to Zendesk. "Transifex has made crowdsourcing translations a breeze!" Transifex has so many amazong tools for managing translations and internationalization! Transifex makes the complexity of managing translations from both paid professional translators and crowdsourced translators feel simple and seamless. The collaborator limit is low. I wish it wasn’t so expensive to add more collaborators. Or maybe were only charged for active collaborators? Solving the ability to manage all translations - both paid and crowdsourced. We save so much oversight and development time, that the cost is worth it for us! We were experiencing some kinks in our Zendesk - Transifex - Translation Vendor integration. Some issues were caused by the translation vendor, some were limitations within Zendesk, some were kinks within Transifex (which they are always working to resolve), and some were EVEN user error (me!). In all four types of scenarios, Transifex held my hand in resolving them, helping me to interact with these other vendors, and finding workarounds when a direct solution wasn't available. This is a very specific shout-out to Samuel Chan and Brendan Kenney, who sat through as many screen-sharing meetings with me as I needed to get our translated content uploaded to our Knowledge Center. This often involved helping me learn the ways of external products (Zendesk) for which these guys did not have to provide support! Transifex and their customers are lucky to have these guys. Of course there are kinks still left to be resolved, but anyone working in software understands this. We publish our user support content as Zendesk Knowledge Center articles. We translate those articles into various languages, using Transifex as the system between us and the translation vendor. We use to automate the translation orders, retrieval, and upload into Zendesk. This enables us to provide localized content to our users around the globe. "A recommended software for developers"
Transifex is a great software that managing localization for software developers . As far as its functionality, I considered this software as an popular source code repositories. The best feature that i think would be good for developers is the ability to edit and localize patches that they need to release.. Also It can be used as a standalone system for managing string catalogs as well as use with other continuous integration systems. My company use Transifex as a tool of our software localization process . We decided to integrated with our servers so that the new prompts to be translated and published as soon as new release, patches are pushed. "The product that changed our approach to translations"
- The API and its client: We have set up our CI system to automatically upload any new strings to be translated and download all translations that are reviewed with every single patch and release. there has been a very short while the API had some hiccups but for quite a while it has been handling our heavy load quite well. A+. - Translations memory: This has saved my life personally as the Turkish translator of Disqus but it is also very useful even just to find similarities between certain strings to the translations are consistent. Works very nice with the product vocabulary feature. On top of this they have good support (although you need it quite infrequently). The team management UI, messaging and community building and managing tools can use some help. They definitely do the job but they are not great when you need to use them just when you need them. I'm sure people using the UI can get used to it after a short while but as an engineer, every time I need to do something, I waste some time finding just the right place and button for certain things. I'd definitely get connected with one of their account managers first to get a nice intro. After that I'd look into integrating them to my CI and getting the crowd-source thing rolling. We have made Disqus available to 90+ languages and frankly we almost stopped caring about translations or numbers at some point. After the CI integration and some community kindling, it was just an engine that keeps itself running with minimal input. The great translation UI and key features like easy plural translations keeps people engaged. "A Localization Management System Built By Software Developers For Software Developers"
Transifex is a great localization platform for software developers and development teams. It is modeled after popular source code repositories like Github, but also has editing features that translators can work with easily. It can be used as a standalone system for managing string catalogs along with ordinary documents, but can also be used in conjunction with continuous integration systems. Transifex is not really designed for managing document translation. If you are focused primarily on content translation, especially richly formatted content like InDesign or PDF documents, its probably not the ideal tool to use for that. It's sweet spot is software localization, as it was designed by software developers for use in software development. That's OK, there are plenty of other translation tools to use for other types of content. If you are a software developer or manage a software development team, this is probably the best option available for managing software localization. Their pricing is reasonable and transparent. Other tools often require an annual contract with significant up front commitments, while Transifex has a simple tiered monthly price structure (pricing is based on the number of words in your translation memory and number of target languages, so the costs are predictable and easy to control). We use Transifex as a key part of our software localization process at Insightly. It is integrated with our build servers so the system picks up new prompts to be translated as soon as new builds are pushed. Meanwhile, our language service providers have an easy time working with the materials we need translated (mostly string catalogs, plus associated content like mobile app store listings, offline documents, etc). Reporting capability is fairly limited. Can be difficult for LSPs to calculate cost. "Localization is just a yaml file away"
Transifex makes it easy to upload a localization file, identify missing translations, translate them (either with by a teammate or outside company), review the translations, and download the completed localization file. I especially like that it's very simple and affordable (starting at $20) to contract with an outside translation company directly through Transifex. We use Github-flow (agile, branch-based feature development). It's been a learning process integrating translations into our process. Transifex is able to support this, but it's not yet first class. We use Transifex to ensure we have high quality, plain-language translations with minimal friction in our design and development process. "Awkward navigation hinders its use"
They have conducted a change in branding which updated the site's color scheme among other elements. It is much more attractive visually, and it's performance is good enough. That after all these years, navigating projects and languages is still very cumbersome and confusing. That after logging in thru a certain project page, you aren't sent back to the page you were in, but to your dashboard, where you have to search for the desired project again, which is annoying if participate in a lot of teams. That you can't just follow a project link received via email without being logged in beforehand (you get an annoying error 500 page with no option to log in). It spares me of the need to manage multiple .Po files manually, across languages. It lets me do automated localization integrations into my git repo. How my translators say they don't receive all the notifications. The initial setting up and uploading of existing translations was a bit time consuming but it was all well worth it, we are spending less on translations now, and are looking to hook up our api for even more hands off translations. I really enjoyed the speed of their translations, and it's accessibility to use. Additionally, I enjoyed their free trial with no credit card needed, it allowed me to really check out what the product was all about before we committed to anything which was nice. I did have a hard time understanding all the tools at first, and it took me a minute to really get grasp on it. I am a little bit new to the software implementation, however, so some may not struggle with this as much. Since we work with a large amount of international students, the fact that we know can easily and immediately translate services for them is absolutely phenomenal. It really opens up our doors and allows a better access to our students demographics. There are many filters, many data formats are supported, many languages, roles and work with teams. Not very good for "only with the keyboard" work. Not a laconic interface. I translated the software, got the opportunity to work comfortably, for a small project it's free, so it's also an opportunity to attract like-minded people. "A localization platform I would recommend to other companies"
Transifex has a very good and quick to respond customer service. The Translations Memory (TM) is a great tool that saves us a lot of work and costs. We localize almost all Waze related products for our gloval users via Transifex. Friendly environment, very helpful and easy to work. Some of the translations are not a true representation of the original, native speakers will not be fooled. Depending on your needs, it could be worth investing in. Saves time and potentially money. I have not realized fantastic benefits as of yet. The access to the platform and the ability to customize it. The cat tool isn't as functional it isn't as robust as i would prefer but i will work! I like the seamless translation of words from one language to another and it is cloud base app so no need to work on the non-technical stuff. They supported a lot of platforms and documentation format that ease the translations. Its kind complicated for non-technical person to manage this kind of tool. I like the fact that I can communicate with other engineers globally to generate solutions at home without anything being lost in translation. We are transcribing data from different regions of the globe, and sometimes need translations to clairfy and speak with the original author of whihchever plans we are surveying. I'm using Transifex as a translator and I had a great experience using it. Firstly, the interface and simple and fast. A great UX is provided for translation history, glossaries.. everything required is present for translating a project. "Transifex is solving my problems!" "The software is quite convenient and very useful for daily life." The convenience of the software and popularity among the society. I think the cons of this software is that we need to get familiar with it first. We can easily understand waht others are talking about on the website. The busines problems I am solving are customer escalations. The ability to work with multiple freelancers in an online platform, without them having to pay for installation costs. The helpdesk cannot be reached by phone, only via email. Everything is stored and automatically generated. Transifex is a way to store your information and also digitize files. I like everything that I know about it. We are able to quickly access our apps and information now that we are digital. I was not a fan of this product and I also did not like that it was pretty hard to navigate. I think they should consider adding a tutorial or training to help with the ease of using this software. We were trying to prioritize our stocks but this may not have been the correct software for this. "Expensive if you need it to be." Transifex offers different payment plans to fit your company's needs and budget. In addition, it's widely used and extremely accurate. I have no complaints. I can only say that it's competitors are cheaper in cost. We have the starter $79/mo pricing plan, as we are a small company. We were able to accurately translate our website to five different languages. It got the job done. * We monitor all Transifex reviews to prevent fraudulent reviews and keep review quality high. We do not post reviews by company employees or direct competitors. Validated reviews require the user to submit a screenshot of the product containing their user ID, in order to verify a user is an actual user of the product. Hi there! Are you looking to implement a solution like Transifex?